The Khanate of Astrakhan (Xacitarxan Khanate) was a Tatar Turkic state that arose during the break-up of the Golden Horde. The Khanate existed in the 15th and 16th centuries in the area adjacent to the mouth of the Volga river, around the modern city of Astrakhan. 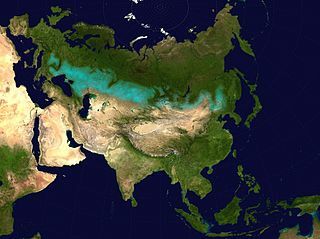 Its khans claimed patrilineal descent from Toqa Temür [ru] (Tūqāy Tīmūr), the thirteenth son of Jochi and grandson of Genghis Khan. 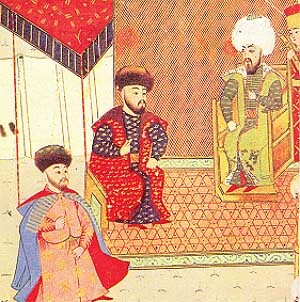 Mahmud bin Küchük established the Khanate in the 1460s. The capital was the city of Xacitarxan, also known as Astrakhan in Russian chronicles. Its territory included the Lower Volga valley and the Volga Delta, including most of what is now Astrakhan Oblast and the steppeland on the right bank of Volga in present-day Kalmykia. To the south was the Caspian sea, to the east the Nogai Horde, and to the west Nogais who were theoretically subjects of the Crimean Khanate. The area was a natural center since it was the intersection of the north-south trade route down the Volga to Persia and the east-west trade route north of the Caspian. From the 6th century it was populated by various Turkic-speaking tribes. They formed two states: Old Great Bulgaria (c632-668) and the Khazars (c650-969). Following the Mongol conquest the western steppe broke off and became the Golden Horde (c1240-1502). In the fifteenth century parts of the Horde broke off as follows: 1438: Khanate of Kazan, 1449: Khanate of Crimea, 1466: Astrakhan, 1480: Russia. The steppe remnant ended in 1502 and steppe peoples around Astrakhan became the Nogai Horde. Most of the population of the Astrakhan khanate were Astrakhan Tatars and Nogays. Merchants carried on a transit trade between Muscovy, Kazan, Crimea, Central Asia, and the Transcaucasus region. The nobility consisted of feudal ranks, which were, from highest to lowest: the khan, sultans, begs and morzalar. The rest of the population were known as qara xalıq, black people (or more accurately in Old Turkic, "great creation" implying 'the creatures at large" or common folks, when "qara" stood for "big" and "great" not just black, and "aq" (white), stood also for delicate, small, dainty etc. )- the standard Turkic designation for commoners. The state religion was Islam. With its conquest by the Russians in 1556, Islam was largely replaced by Russian Orthodox Christianity, though the region to this day is home to a Muslim minority. The Kalmyks are largely Buddhist. The Astrakhan khanate is poorly documented. According to Frank “The dates and activities of these rulers are faintly represented in the sources, when they are represented at all.” About all we have is an imperfect khan list with uncertain regnal dates and a few military and diplomatic events and traveler's reports. The capital was Xacitarxan, which the Russians called Astrakhan, 12 km north of modern Astrakhan. After the conquest, the town and name were moved to the present location. The khanate is said to have been founded 1466  but did not become fully separate from the Golden Horde until the Horde's end in 1502. In 1459 the Golden Horde ruler Küchük Muhammad died and power was split between his sons Ahmed Khan bin Küchük, the man who lost Russia in 1480, and Mahmud bin Küchük who was based around Astrakhan. The khanate was founded either by Mahmud or his son Qasim I.The khans of Astrakhan were all descended from Mahmud or his brother Ahmed. It was visited by Ambrogio Contarini in 1476. Howorth (only) says it was besieged by Ahmed and Ibak Khan some time before 1480. The Russian Wikipedia (only) says it was besieged by Ibak's brother and the Nogais in 1492. It was twice briefly occupied by Crimea (Mehmed I Giray in 1523 and Sahib I Giray in 1549). The khanate traditionally had military and diplomatic relations with Crimea, the Nogais and sometimes the Circassians. Diplomatic contact with Moscow began in 1532 or earlier. About this time Moscow was expanding east toward Kazan which it conquered in 1552. It also was gaining the power to exert force down the Volga between Kazan and Astrakhan, something that is not explained in the sources. In 1551 Yamghurchi of Astrakhan made a nominal submission to Moscow. He soon changed sides and allied with Crimea and the Nogais. Russia sent 30000 troops against him. In 1554 he fled the town and Russia imposed its client Dervish Ali Astrakhani who soon began intriguing with the Crimeans. Russia sent more troops and occupied Astrakhan in 1556, proceeding to destroy the largest slave market on the Volga. In 1558 'Astrakhan' was moved 12 km south to its present location. In 1569 the Ottomans were unable to regain Astrakhan for Islam. Henry Hoyle Howorth, History of the Mongols, 1880, part 2, pp 349–362. ^ Welsford 2012, p. 37. ^ In 1466 Mahmud bin Küchük sent a letter to the sultan claiming the area as his patrimony (Frank, page 253). This may be the source of the 1466 date. The Crimean Khanate was a Turkic state of the Ottoman Empire from 1441 to 1783, the longest-lived of the Turkic khanates that succeeded the empire of the Golden Horde of Mongol origin. Established by Hacı I Giray in 1441, the Crimean khans were the patrilineal descendants of Toqa Temür, thirteenth son of Jochi and grandson of Genghis Khan through marriage; Temür married one of Genghis Khan's granddaughters. Though, according to a well-know Russian historian, Doctor of Historical Sciences, professor of the Russian Academy of Sciences Zaitsev Ilya Vladimirovich, the Crimean Khanate was an independent state during all its history. The khanate was located in present-day Russia, Ukraine, Romania and Moldova. Devlet I Giray was a Crimean Khan. During his eventful reign: 1552: Russia took Kazan, 1556: Russia took Astrakhan, 1569: Turks fail to re-take Astrakhan, 1571: Crimeans burn Moscow, but next year they were severely defeated. During his reign there were a number of Cossack raids on Crimea. Except for 1571 his wars with Russia were not very successful. He does not seem to have made war on Poland-Lithuania. Mehmed I Giray was khan of the Crimean Khanate. He was preceded by his father Meñli I Giray (r.1478-1515) and followed by his son Ğazı I Giray (1523-24). He gained control of the steppe nomads, put his brother on the throne of Kazan and was killed after taking Astrakhan. Had he not been killed he might have joined the three khanates with the Nogais and re-created something like the Golden Horde. The steppe and forest-steppe of Ukraine and southern Russia is good agricultural land, but it was traditionally held by pastoral nomads. Any state that could drive off the nomads and fill the land with tax-paying peasants would expand its power enormously. During the period 1500–1800, this region was taken under Russian control. Ahmed bin Küchük was a Khan of the Great Horde between 1465 and 1481. In 1465, Ahmed Khan seized power in the Horde by rising against his brother Mahmud bin Küchük, who had been its ruler since 1459. In 1472, Ahmed Khan entered into alliance with the Polish king Casimir IV against Ivan III of Russia. In 1476, Ahmed Khan suggested to Ivan III that he should recognize him as his overlord. However the situation of forces was not in the Horde's favour.